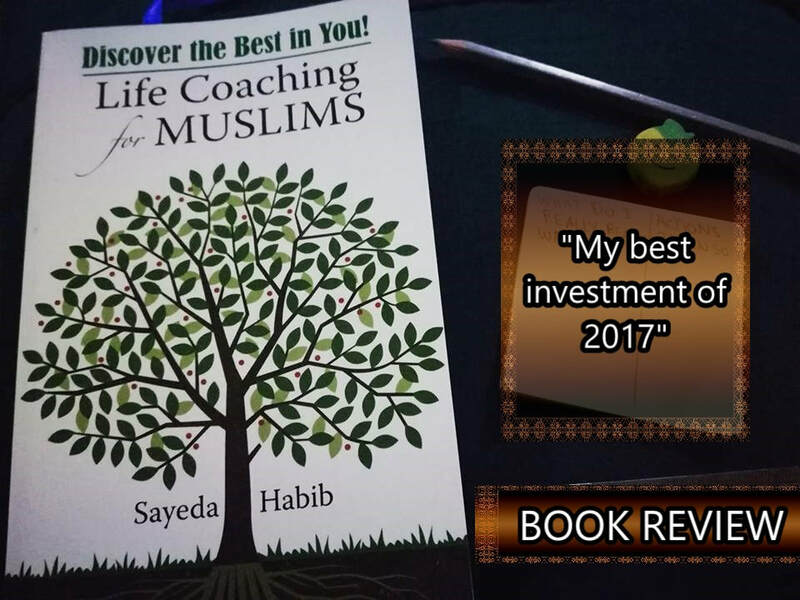 Life Coaching For Muslims by Sayeda Habib was my best investment of 2017 and if I had finished it earlier it would surely have been a part of Books That Made My 2017 A Better Year blog post. But this was a book that I had to read slowly because of its theme. The reason I consider this book an investment is because its contents will come handy to me in different phases of life. The author of this book is a life coach and that is one reason it makes the book authentic. I am a psychologist but I have been fond of the work life coaches do. I ordered this book because I was looking for inspiration to set better goals in some areas of my life. Life Coaching For Muslims is packed with lots of exercises and activities. By using this book I was able to set lots of goals related to my short and long term goals, time management goals, self-care goals and lots more. I would say that if you are always planning, working on new goals and ideas and looking for places to brainstorm your thoughts then you ought to purchase Life Coaching For Muslims. 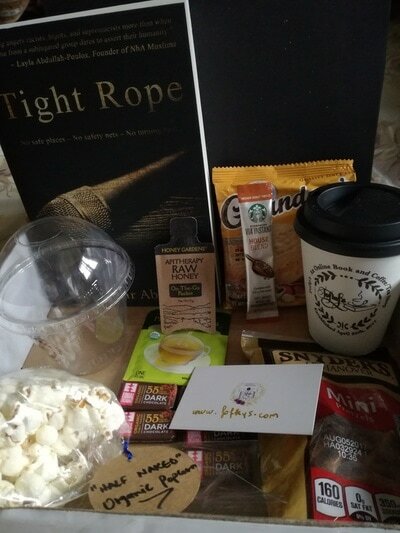 HAVE YOU CHECKED OUT THE MUSLIMAH BLOGGERS SUMMIT YET? The Life Coaching For Muslims is not a lengthy book but it is one to take your time with. Use this book during the early hours of the day. Don’t read it at night, especially during bedtime because it will leave you motivated and wide awake at night. The best time is during early morning while you have your coffee or tea and I assure you that is going to be a good start to your day. Another thing that I liked about Life Coaching For Muslims is that the book is colourful and has glossy pages which makes working with it a fun experience. I would really recommend this resourceful book that is going to add value to your library. In fact, high schools and universities should stock Life Coaching For Muslims in their library as it will be highly useful for their students. These books may not have been released in 2017 but I am not one who goes by the newest books. I simply visit a book store and get my hands on whatever I like. So here is a list of books that I read this year and enjoyed it the most. The Holiday Home was the first book that I read after my university ended. I was already in the holiday mood and was craving for a book that will transport me into a beautiful place. The Holiday Home did its job with its beautiful description of the beach and a family that comes together to spend their holiday at the Atlantic House that is situated by the sea. You can read more about the book in my detailed review here. I loved this novel so much that I have bought another of Fern Britton’s novel to be read in 2018. With the amount of fame this book got I don’t think it needs much of an introduction. But still for those of you who are yet to read the book let me just give you a brief outline about this novel. A young English woman living in a small town, trying hard to earn money to make the ends meet for her family is hired at a huge mansion as a caretaker for a young paralysed man. While developing a close bond with this man she discovers his wish to end his life and she soon becomes determined to make him love his life just as he did before the car accident. Me Before You has a second book with the name of After You. Its third book is also out – Still Me which I am looking forward to read in the coming year. I read Tight Rope during Ramadan and it was another book that caught my attention because of a different story line. The author sheds light upon the lives of Americans who are becoming the victims of racism on a regular basis. It just doesn’t cover Muslims, but Black Americans, Hispanics and anyone that does not shares the same complexion as the Americans. Read more about the story here. Another book that I read in Ramadan and loved every bit of the information provided in it. Mufti Taqi Usmani has written on point in this concise book and I would consider it an eye opener for the modern times. It will really help to deal with the misconceptions that the West has formed regarding Islam which is now influencing the minds of the Muslim youth. Read more details about this book here. 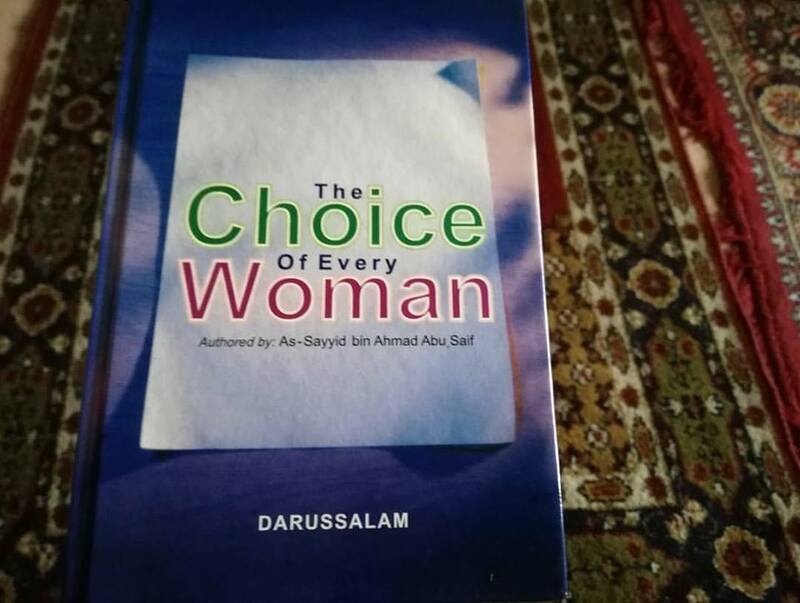 Not that I already know of, but this book has in depth information about the importance of parents in Islam. The glossy pages inside the book are packed with colourful pages which make it a lot more interesting to read. I would say this is an ideal gift for the Muslim youth. Since I had picked this book from a school library I had to return it back before I could finish the book. But whatever I read were beautiful compilations of what it means to show gratitude to Allah and remain patient in times of difficulty. I will make sure I purchase this book for my mini library because it is worth keeping for all times to come. I read this book again after 3 years and it still gave me the same feelings that it did the first time. The novel revolves around a friend who is trying to honour the last wish of her best friend who died in a car accident and had all his organs donated. Read more details about its story here. 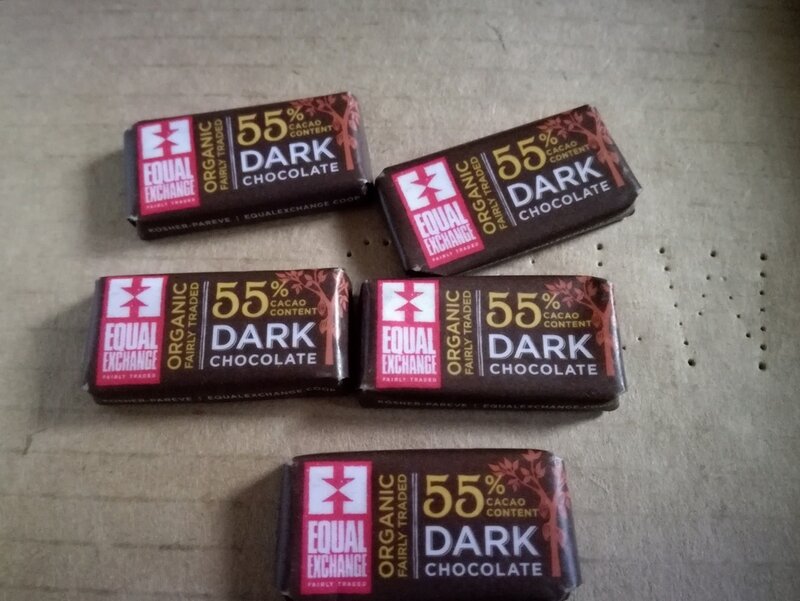 You are going to love this one just as I did. This is a light inspirational novel which is packed with scenes that will bring you tears of joy and sadness all at the same time. If you are at a stage in your life where you are planning to start anew then you ought to give this novel a read. Read more details about this novel here. I am currently reading this so the complete review will come as soon as I finish with it. Even though I am reading this book in 2017, I had read it back in 2011 and I would say it was a life changing book. This book had made me respect my body, love it the way it already is and amend my lifestyle in a way that it would benefit my body to become leaner and fitter. I went through similar feelings as I started reading this book again this month so I have to say it made the remaining of my 2017. These were the books that made my 2017 fantastic and awesome and at times bearable as well. 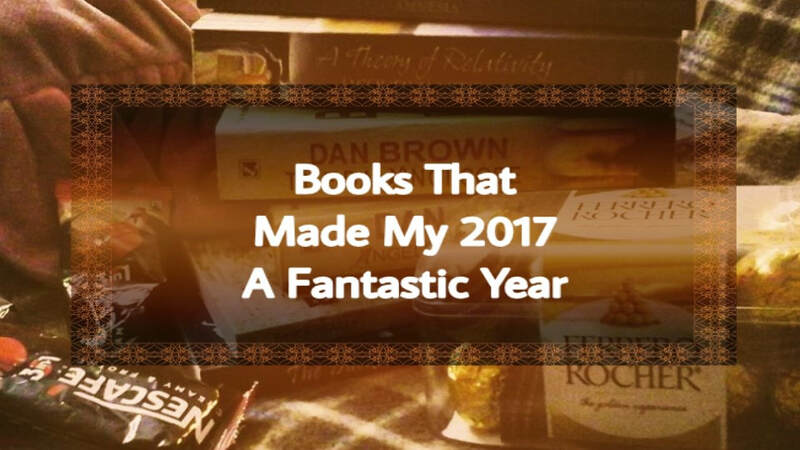 :D Tell me about your favourite books of 2017. 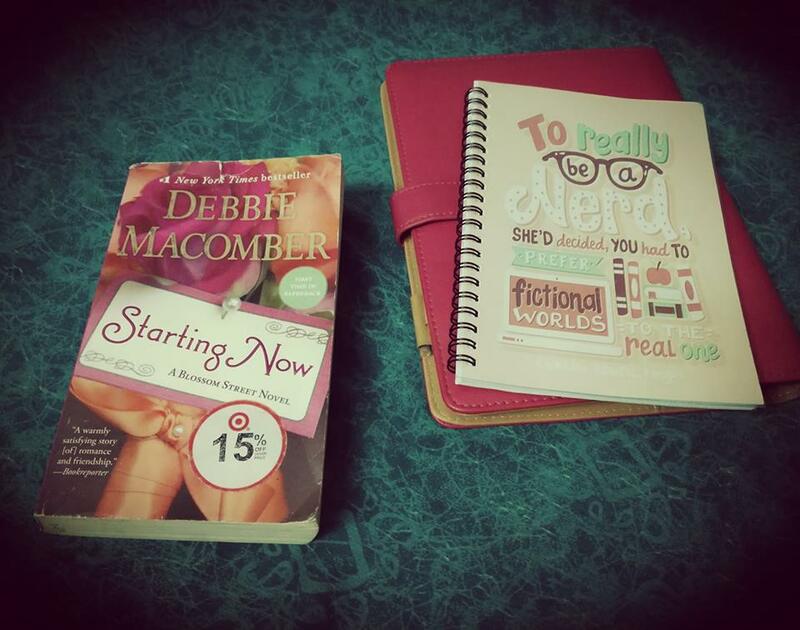 Starting Now by Debbie Macomber was one of those books that I wanted to get my hands on from the first glance. It was the title that drew me towards the book and I must say I wasn’t disappointed. The story revolves around several characters but the main character of this novel is Libby Morgan. Libby Morgan has recently lost her job and is in a devastated state. She had put her whole life at stake which included her marriage just to get partnership offered at her firm. As an unemployed person she discovers herself doing things that she never thought she would, such as rocking babies at the nursery, knitting at the yarn store, helping a pregnant teenager and falling in love with a person who is known to have the heart of a stone at the hospital. But soon after finding happiness in her new life she is called back at the firm which would mean long hours of work and no time for the precious bonds that she recently developed in her life. Starting Now is packed with lots of love, friendship, some romance here and there, and motivation for someone who is planning to start over. This is an ideal book to be read during the winter season while tightly wrapped in your warm blanket. Debbie Macomber has done a tremendous job with this novel. I am planning to buy more of her novels in the coming year. Hey, Good Looking by Fern Michaels is one of a kind. I read this book for the second time and I wouldn’t ever want to give this book away. While many books begin from friendship, this one is initiated from a death of a best friend and it will give you both tears of joy and sorrow. Darby and Russell are childhood friends. Russell’s last wish is that his organs should not be donated ever after his death but his stepmother donates every organ after he deceases in a car accident. When Darby discovers it, it is too late for her to do anything but she tries hard to honour her best friend’s last wish. This journey of Darby trying to make things right even after the damage has been done is what makes this novel different. You might think the book is depressing but it is a mixture of love, friendship, romance and humour. You are sure to enjoy it till the very last page. During my childhood I happily read a section in my favourite weekly magazine which was called ‘Expressions.’ The section was filled with beautiful poetic sentences on various topics and I waited all week just to grab a new issue of that magazine and quickly flip to that section. I had the same feeling of excitement while reading Unveiled by Rumki Chowdhury. The book is filled with simple yet beautiful words of expression from a Muslimah hijabi’s perspective. It also comprises of pretty black and white illustrations which if in hardcopy (I had the ebook), I would have loved to fill colours into. 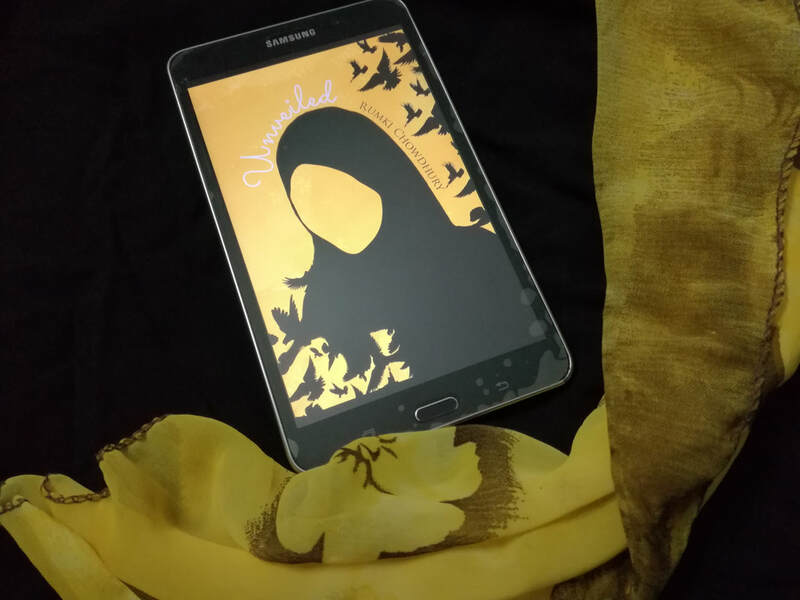 The author’s words are motivating for anyone who is determined about their hijab and I would recommend it to be the perfect gift for anyone who enthusiastically reads poems, quotes or is simply a hijabi in need of motivation. The book can also be read by young Muslimahs and can also be included in children’s reading sessions at school. If this review has drawn your interest towards purchasing the book then do so. The proceeds from the purchase of this book will go in charity. You can even find the free ebook on Djarabi Kitabs Publishing website. To purchase the book you can either purchase it from the publisher's site or Amazon. Once you read the book don’t forget to come back and let me know how well you liked my book recommendation. Books are one of the best sources of knowledge but unfortunately in the recent years the Muslim youth turns to the internet when it comes to seeking Islamic knowledge. Many of the websites that are providing fatwas and guidelines of Islam are not even authentic. Most importantly, majority of these websites don’t reveal the real person’s name or the organization’s name. So the question is how we can trust them blindly for providing us authentic information. Here are some Islamic books written by Muslim authors. 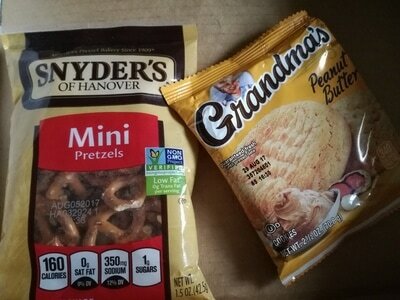 They are filled with lots of information and I highly recommend them. The book focuses on the importance of obeying and respecting parents. What I loved the most was that the book is filled with lots of incidents of different people in respect to how life treated them when they obeyed or did not obey their parents. The narrations from various people are quite intriguing. Also, the colourful and glossy pages of the book make it more interesting to read. I’d say this is an ideal gift for the youth which will be cherished for years to come. I really loved this compact book filled with 99 names of Allah along with their meanings. Each page is of a different colour making it more attractive to read. This book should be a part of every library and all age groups can benefit from it. If you are a teacher, parent or someone who runs an educational institute then this book is for you. The book has beautifully described the characteristics of Prophet Muhammad (p.b.u.h) as a teacher and the guidelines of how he educated the youth. I recommend this book to be kept in libraries of educational institutes so that the staff can benefit from the knowledge provided in the book. As humans, we all go through hardships and what if we have a companion to teach us the importance of patience and gratefulness, which many of us don’t have. If you are trying to work on yourself in terms of developing patience and gratitude then you ought to grab this book. Not to mention, it is filled with Hadiths and Quranic ayahs to give you more insight into the Islamic point of view regarding patience and gratitude. I hope you will add these books to your library or book collection. Which book are you planning to read? Do comment it below in the comments section. Also, if you think this blog post will benefit your friends and family then do click on the ‘share’ button. Does Islam support modernism? Can Islamic rulings be applied to the current times? How can Islam be modern when it commands its women to cover themselves from head to toe? These are some questions that we get to hear on daily basis. I read Islam and Modernism written by Mufti Taqi Usmani in Ramadan. This wasn’t the first time that I was reading this book in my life but it was the first time when I was reading this book in my adulthood. 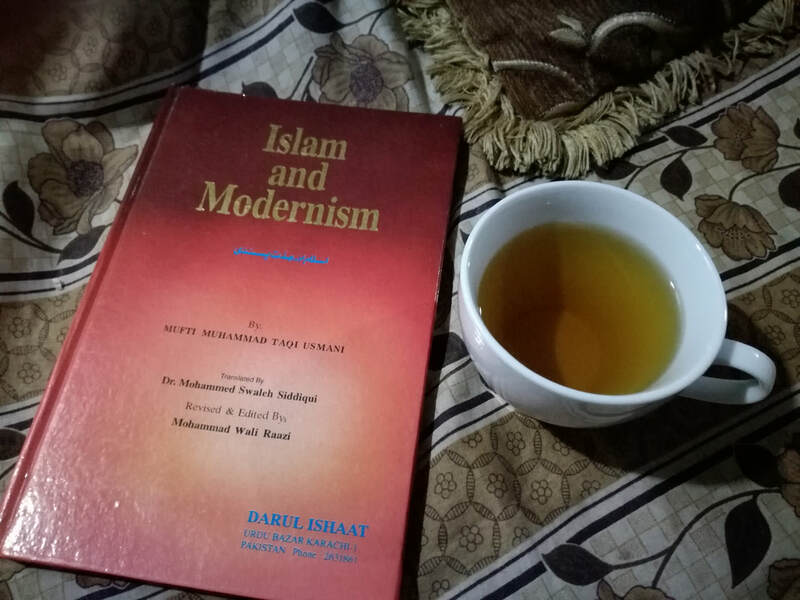 Islam and Modernism focuses on a lot of Western topics that has brainwashed Muslims for a long time. It logically explains the concept of Islamic rulings and how people have twisted it in the past and still do so in order to make it more convenient for them. The book can challenge your modern mindset with logical arguments. It gives a true meaning of modernism and talks about how Islam encourages modernism. Mufti Taqi Usmani has done a good amount of research in compiling situations from the past to back up his arguments. His knowledge in Deen is what makes this book worth a read. I’d say that every Muslim must have this title in their book collection, not just for them but for the generations to come. P.S. If you are planning to purchase this book, I'd be happy if you purchase it from the link provided below. 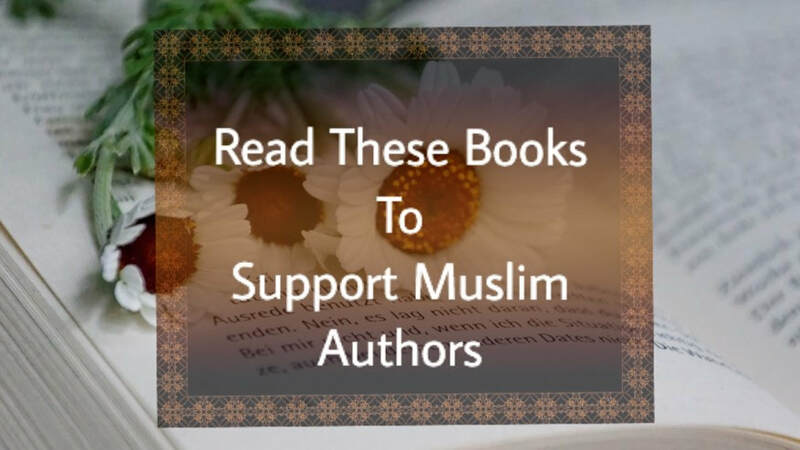 ​A lot of Muslim authors are now stepping up to finally get themselves published and I believe that as Muslim brothers and sisters we must all try our level best to support their talents. Brick Walls written by Saadia Faruqi is a collection of short stories that talks about the everyday struggles a Pakistani goes through and yet remains hopeful about a better tomorrow. The stories in this book highlight those emotions that no media ever attempts to show to the world that exists outside Pakistan. How To Be A Happy Muslim written by Sheima Salam is a self-help book for anyone who want to focus on the higher perspective of this life and want to see much more deeper than the simple desires of this world. The title of the book consists of the word ‘happy’ but within the book the author actually focuses on living a meaningful life. The story’s main character is Hanifa who is a 19 year old girl and has just being relocated to Brazil. The story is based way ahead in the future when talking about God and the Last Day is considered a crime. A huge army of senators is ruling the people and they believe that the world will never end thus anyone heard talking about the Judgement Day or preaching people about God will be put behind bars. Hanifa’s family is secretly worshipping Allah and has forbidden their children to not mention anything about the Last Day which has already gotten them in trouble before when Hanifa spoke about it in public. Despite all that Hanifa is adamant to fulfill a greater purpose in her life and she wishes to create an army which can be strong enough to beat the senators. Finally putting her plan to action she becomes an undercover by joining the senators and starts making a team of her own to fight the senators while also hiding her whole plan from her family. The book Normal Calm revolves around the life of a young girl, Amina who belongs to a conservative Muslim family. For her higher education she is allowed to move away from her family and live in a hostel during which she encounters with a tragic event that makes her feel that her whole life is ruined. She gets raped by her own class fellow who flees away and Amina is left to deal with all the issues. As life passes, Amina faces a lot of problems related to her marriage and this is what made the story more interesting to see how Amina tackles with it all. The White Elephant is a book that prepares one for their marriage. The author has used her own experience as well as knowledge from her education and training in public health, crisis intervention and disaster management, and life coaching. #Alhumdulilah For Series is a gratitude journal designed exclusively by Ayeina. It is a wonderful journal diary compiled with cute pictures as well as a dedicated spot so that we can fill in our entries. The entire purpose of this gratitude diary is to make you realize the little things in life that are a blessing upon us but we often seem to overlook them. Stoori has written poems using Islam as the basic theme. Through her poems she has written about modesty, backbiting, prayers and Allah. I believe this is a must read for adults even if they are not into poems and you should even purchase this book for your children because the poems are easy to grasp and can serve as a way of learning more about Islam. In fact I think that books like these should become a part of school courses in Muslim countries. 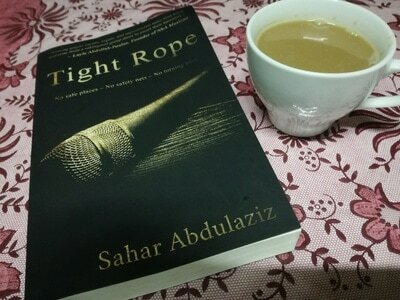 Tight Rope by Sahar Abdulaziz revolves around six characters. Nour Ibrahim is a speaker who is currently receiving hate emails for speaking out for the racism taking place in America. Russell J. Tetler, a patriotic American, believes that America does not belong to anyone comprising of brown and black skin colour. Maryam Quinonez has newly accepted Islam and living with her Catholic parents makes her life no less than a roller coaster ride. Eugene Underwood is a criminal who goes about killing people to earn money. Zaid Ali works in his father’s deli, is secretly planning to join the American army and is attracted to a Muslim nurse who is his regular customer yet knows nothing about her. Doris Tetler is Russell’s wife and is apparently making plans to get rid of her husband. ​I really hope that you enjoy these books. Don’t forget to comment below with your own recommendations. If you would like to contact me for book reviews, do so at aisha2aboo@gmail.com. Is there something special coming up for your book lover friend and you are yet to come up with an idea to make their special day worthwhile? Then you ought to check out Fofky's - Online Book and Coffee/Tea Shop. 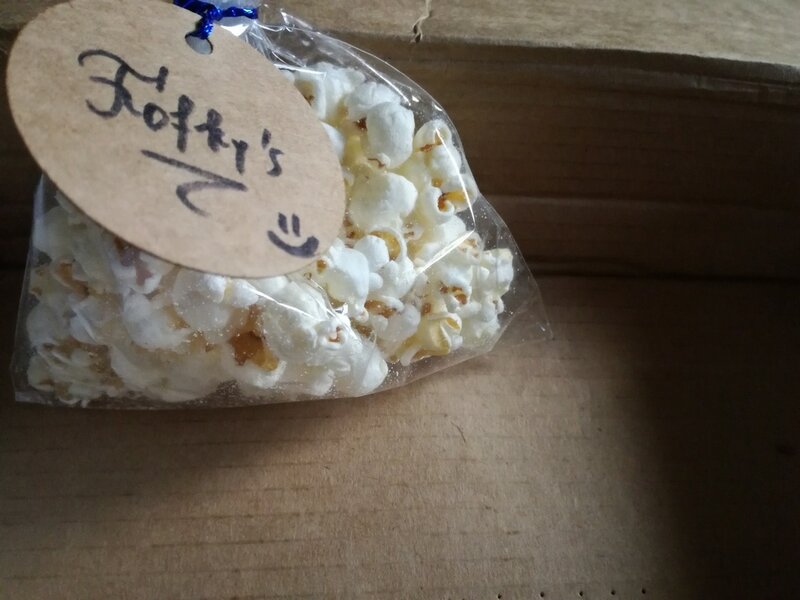 I received a box from Fofky's last month but with Eid and a lot of flu I wasn't able to review the box soon enough. 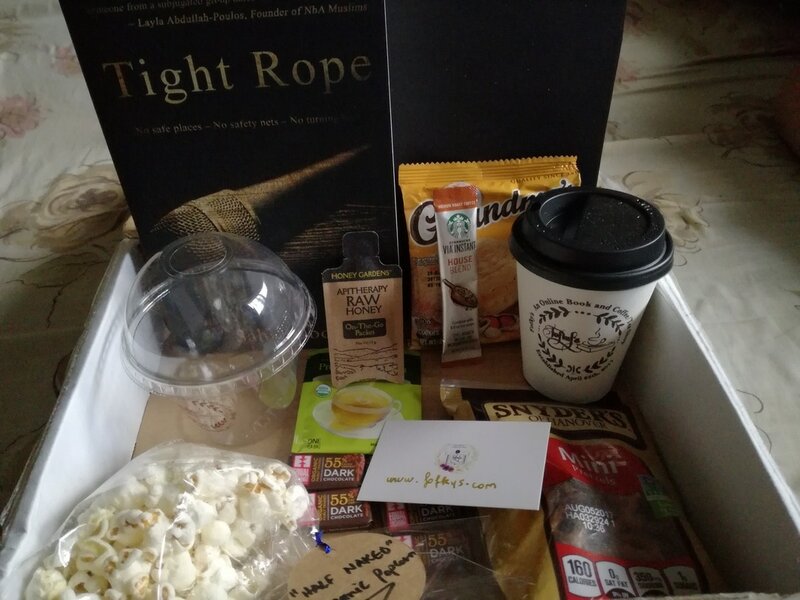 The Fofky's box comprised of the book Tight Rope by Sahar Abdulaziz (check its review here), it had a sachet of instant medium roasted coffee, a sachet of green tea, few dark chocolates, a packet of pretzels, organic popcorn, peanut butter cookies and a small sachet of honey. It also included a 2 disposable cups, one for the hot green tea and other for the Fofky's Frappuccino, the recipe for which was included in the box. 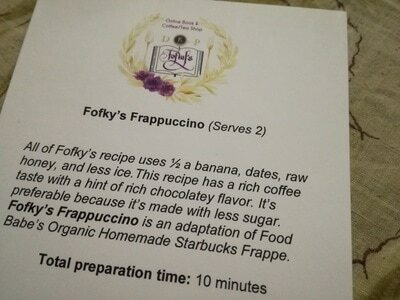 The grounded coffee that came with it had to be used in the recipe. You can check out more pictures below and if you like it, head on to the Fofky's page to order it either for yourself or for your reader friend. It surely is a box full of delight!